Gold should give us the setup for long trades sometime this week. I have covered and will continue to cover the potential trigger events and technical targets for metals in the nightly reports. Remember the time to buy is when you’re scared. We should start to see fear this week. 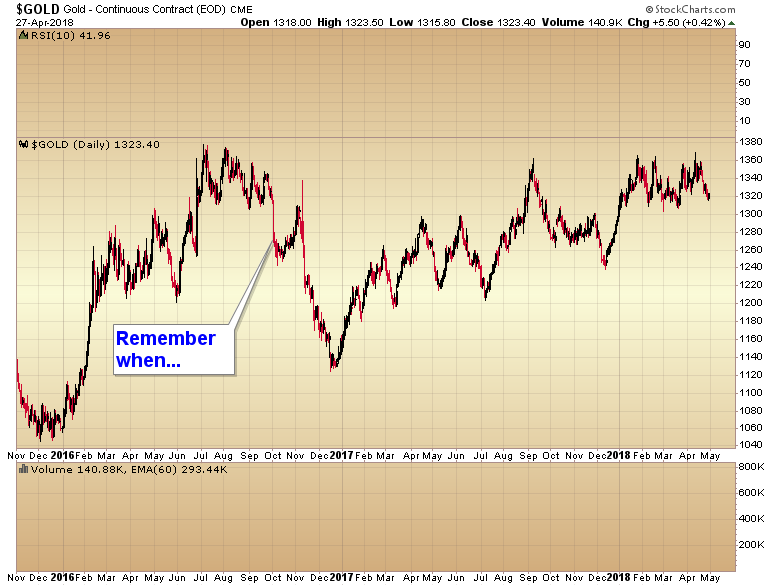 Remember about a year and a half ago when we got caught in the gold breakdown right before the election? Remember Avi, Alex etc. etc. falling all over themselves to call attention to our trade, even going so far as to publish articles about it? We gave back a big chunk of our baby bull gains on that mistake. Of course unlike other analysts I make real time calls. I don’t give traders multiple scenarios and then pick the correct one after the fact or tell you maybe this will happen or maybe that will happen and then two months later claim to have called the exact turn. Most analysts got caught in the election night reversal as well but since they will never do a real time portfolio they can claim to have sidestepped the damage because there isn’t a record of their trades. Yes we got caught. Now a year and a half later the SMT metal portfolio is up 371%. It is possible to recover from a losing trade. And remember these are real time trades, entries and exits. Not the BS multiple scenarios or maybe this, maybe that crap you get with most analysts. This entry was posted in Uncategorized on April 30, 2018 by Gary. This entry was posted in Uncategorized on April 28, 2018 by Gary. During sideways markets like we’re in now the key to making money is patience. But let’s face it, most of you don’t have it, never had it, and are never going to have it. The average retail trader is a gambler always looking for the next trade no matter how poor the setup is. It’s why most people never make any long term money in the market. They over trade. The current market environment isn’t conducive to trading right now. It’s very volatile and whipsawing. The best course of action is to let the market finish it’s consolidation and set up for the next leg up to 10,000. Unfortunately very few people will be able to follow that advice. 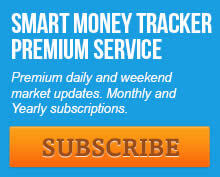 They will jump in and get knocked out of the market over and over as they try to force trades in an erratic market. All they will accomplish is to lose money and have less to work with when the real move begins. Right now the market that is potentially setting up for a trending tradeable move is the metals. If one is patient and gives gold time to finish it’s cycle low then this is the area where I think one can make, and more importantly keep some profits. Of course as always most of you will ignore me until 3/4 of the move has already passed and then you’ll sit up and take notice. You’ll buy high after having let most of the rally pass you by. And you’ll end up selling low during the next correction. Maybe this time you pay attention, buy low and make some money off the next rally instead of just repeating the same mistakes over and over. Gold should be within 5-10 trading days of its next cycle bottom. This entry was posted in Uncategorized on April 27, 2018 by Gary. We had a chance to transition into the parabolic bubble when the Nasdaq rocketed back to new highs in March. Unfortunately it didn’t hold. So now we are in the long term bull market scenario. After 24 months of going virtually straight up after the elections we need several months of consolidation before the next leg up can begin. Easy markets are usually followed by difficult markets, and vice versa. We had 24 months of easy. We need a few months of difficult. 1/3 of 24 months is roughly 6-7 months. We’ve been churning now for 3. We probably need to continue this for another 2-3 months before we start the next trending move that will take the Nasdaq to 10,000. The fact that the SPX failed to break the February lows is a pretty dependable sign that the market has begun a large multi month triangle consolidation. This entry was posted in Uncategorized on April 26, 2018 by Gary. Gold is moving down into the daily cycle low I was looking for. It shouldn’t be too much longer before we get the bottom and I think the next leg up will finally break out of the year and a half basing pattern. We’re just waiting on the euro and yen to complete their intermediate cycle declines. This entry was posted in Uncategorized on April 25, 2018 by Gary. For what it’s worth I think the metals are just about ready to break out of the basing pattern they’ve been in the last year and a half. I’m looking for a quick dip into a daily cycle low soon and then we could be off to the races. This entry was posted in Uncategorized on April 21, 2018 by Gary. My theory is that the bear market in the dollar will cause inflation in all assets. We are starting to see that now in my opinion as stocks, gold, oil and the CRB all rise together. This entry was posted in Uncategorized on April 18, 2018 by Gary. It’s starting to look like stocks are forming a triangle continuation pattern as they consolidate the large gains since the election. I’m still seeing a lot of analysts trying to call a top. It’s still too early in the 4 year cycle for a major top. During Kondratieff spring, 4 year cycles should be strongly right translated. It’s unlikely this 4 year cycle will top until mid to late 2019. 10,000 is going to be a piece of cake. This entry was posted in Uncategorized on April 17, 2018 by Gary. I’m going to say Armstrong will be wrong again like he almost always is at major turning points. We aren’t going to have a strong dollar. I think we’ve started a bear market in the dollar and that will trigger inflation in stocks and commodities. He’s almost a year and a half behind the curve. Typically bear markets in the dollar have lasted about 8 years. So we should have lots of inflation ahead of us for many years yet. This entry was posted in Uncategorized on April 16, 2018 by Gary. How stupid are the perma-bears?